Bullets don’t always kill people, time always does. Such is the provocative statement on which Yvan Arpa has based his latest creation. 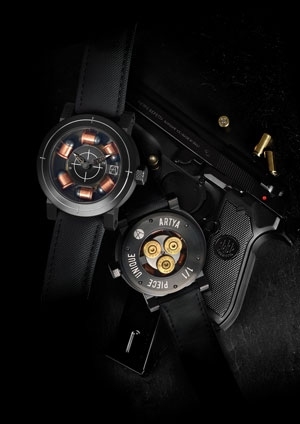 Son of a Gun is an original match between watchmaking and the world of firearms. This world-first model houses six real 6 mm Flobert bullets suspended between the dial and case. The dial and bezel represent a target. Behind them, the oscillating weight of the Swiss automatic movement is ballasted by three special 38 mm bullet cartridges. A redoubtable horological “weapon” signed by the brilliant Yvan Arpa.